A classic Potage Parmentier is made with five simple ingredients: potatoes, leeks, water, salt and cream. When executed properly it can be a delicious warming soup in a stick to your ribs kind of way, but four out of the five ingredients have little to no flavor. So really this is a leek soup that’s been thickened with potatoes and enriched with cream. I’ve updated the recipe with sweet potatoes, which are not only have more flavorful than regular potatoes, they are a better source of vitamin A, vitamin C, fiber and calcium. Celery brings some vegetal notes and more fiber, and soymilk stands in for the cream, making the soup creamy, without being cloying. Personally I prefer this to the classic, because sweet potatoes are sweeter and have more flavor than ordinary spuds. The fact that it’s vegan, low in fat, and cholesterol-free is merely a serendipitous consequence. It’s also absurdly simple to make. Perhaps the most tedious part of the whole thing is to clean the leeks, which are notorious for trapping dirt and sand between the leaves. To save time, and to ensure you get rid of all the grit, I like to slice the leeks up and use a salad spinner to wash them. If you fill it up with water and move the leeks around, you can literally see the sand falling to the bottom. The best part of this approach is that you can then use the spinner to dry the leeks before sautéing them. Sweet potatoes have more flavor than regular potatoes with lots of vitamins, and this recipe is relatively easy to make. 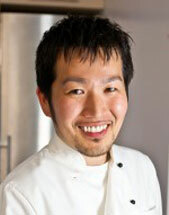 Food blogger Marc Matsumoto shares tips for cleaning leeks in a full post on the Fresh Tastes blog. Trim the end off of the leek, and slice it into thin rings, discarding any darker green leaves. 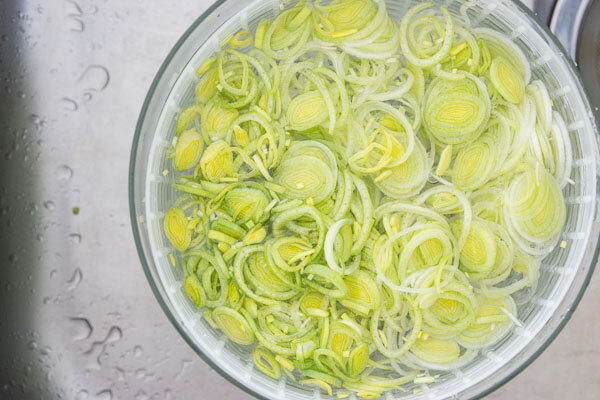 Put the sliced leeks in a salad spinner and fill with water. 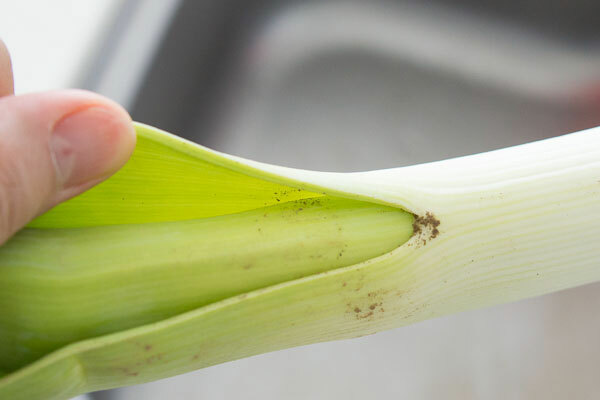 Use your hand to swirl the water around and dislodge any dirt from between the leek's rings. Lift the basket out of the spinner, then dump the water out and repeat once. Dump any water out of the bowl of the spinner, return the basket, cover and spin the leeks to remove the excess water. Add the leeks, celery and olive oil to a pot and cover with a lid. 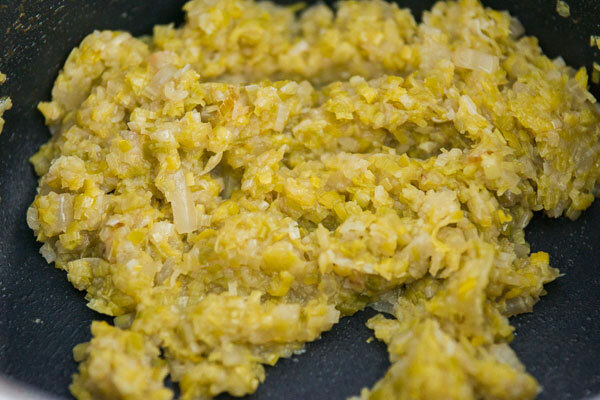 Turn the stove on to medium-low heat and cook, string occasionally until the leeks are soft (10-15 minutes). Remove the lid and turn up the heat and sauté, string constantly until the leeks are reduced to about 1/4 of the original volume and caramelized. Add the sweet potato, 1 cup soy milk, and water. Cover with a lid and simmer over medium low heat until the potatoes are tender and falling apart. Turn off the heat, and then add the rest of the soy milk. 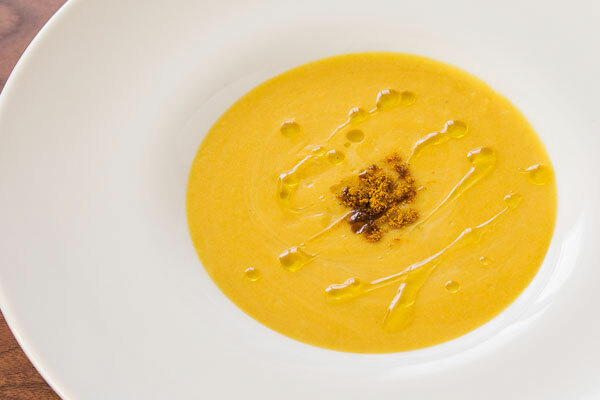 Use an immersion blender or regular blender to blend the soup until smooth. If you are using a regular blender, cover the lid with a large towel and hold it there as you slowly turn up the speed of the blender, otherwise the sudden escape of steam will cause the lid to blow off, spewing hot soup all over you and the kitchen. Add salt and white pepper to taste, as well as more soymilk if you want the soup thinner. Return the soup to the pot to reheat. 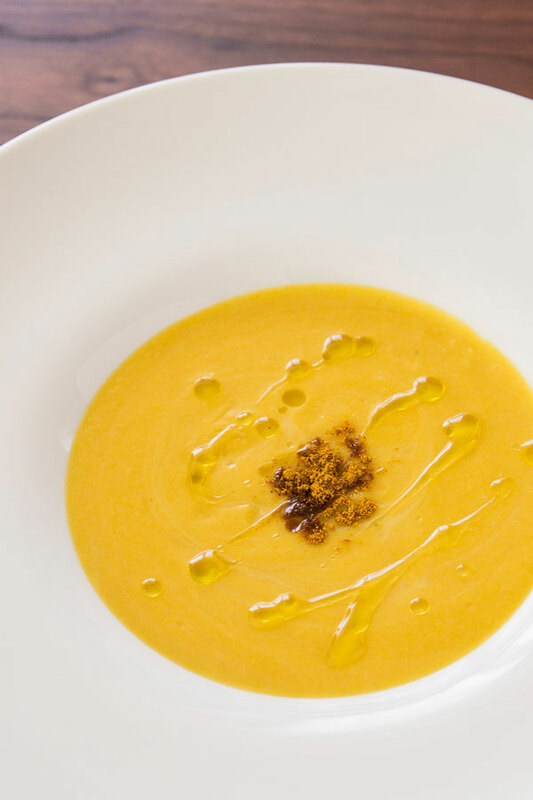 Serve with a drizzle of olive oil and a sprinkle of curry powder.